What makes an airplane take-off? The concept of lift is key to aviation. What makes one ergonomic mat better than others? This paper explores physical and mechanical properties found in effective anti-fatigue matting. First Supposition: In general and within extent, the higher the degree of polarity within an ergonomic mechanism the more effective that mechanism may be. Second Supposition: Effective ergonomic mechanisms depend largely on the symmetry between reciprocal factors. Beyond the Point of Symmetry, the factor in excess is largely ineffective. Third Supposition: Cushion and Firmness are major factors in the performance of certain ergonomic mechanisms that include anti-fatigue matting. The effectiveness of the mechanism is limited by the performance of the lesser factor. Imbalance between the major factors will range from nominal to detrimental. How many auditoriums, meeting rooms, theaters, buses, trains, or even restaurants have signs at the door that say, "Everyone Shall Sit?" None. The signs are not necessary. People naturally sit. Standing for long periods of time - more than about ten minutes - induces a desire for seating. It’s also true that people who work would rather sit than stand. Consider that even large strong professional football players can be seen sitting-down when there is no action. It doesn’t take a scientific paper. Empirical knowledge is enough to conclude that people who have been standing for a long period of time become quite conscious that they have been standing for a long period of time. In other words, there is a certain degree of discomfort associated with prolonged standing. 2. Comparing Apples, Ergonomic seating and Anti-fatigue matting. The time spent being conscious of the discomfort from standing is time lost from fully concentrating on other matters. Imagine two equal groups of people. Each group watches the same two-hour documentary. One group stands for two hours. The other group sits. At the end of the film, each person is tested on content. Overall, the group that sat scored higher than the group that stood. Surprised? The next day the same two groups sit and listen to an eight-hour lecture filled with little-known historical facts. The higher-scoring group is required to sit on hard concrete benches for eight hours. The lower-scoring group is given comfortable chairs. In the end, the group sitting on comfortable chairs scored higher than the group sitting on concrete benches. Surprised again? The fact is: there are a great number of factors involved when comparing apples, seating and anti-fatigue matting. Ergonomics has a subjective element to it. When a person says, "I’m feeling better," we would say, "Great!" We would accept the statement as true that the person is feeling better. We would not ask him or her to prove it with scientific data. In other words, when it comes to ergonomics, the bottom line is how the individual feels during work, at the end of the day and over time. Imagine the Boeing Company making aircraft without understanding the cause of lift. It sounds preposterous. But a literature search reveals that mat manufacturers have written little- even speculatively- on the issues of causation with respect to effective anti-fatigue matting. Even the academic literature falls short, making only vague references to "material," "thickness" and "firmness." Understanding causation is essential in the design for anticipated performance of any product. This paper will discuss the probable causes of performance in anti-fatigue matting. Part II. The Factors of Performance in Matting are Mechanical. 1. The Mechanical Nature of Anti-fatigue Mats. A person’s movement on an anti-fatigue mat is the stimulus for responses within the mat. Identifying the responses is important because within the responses are the causal factors of the mat’s performance. The responses can be identified by eliminating what they are not. The responses are not thermal. Nor are the responses chemical, visual or radioactive. Clearly, the responses within a mat are best described as mechanical. In other words, the mat physically does something as a result of forces placed upon it. 2. The Basic Mechanical Factors. But for most of us, cushion is simply how much the mat "gives" (under known force). Firmness is another important mechanical factor in an anti-fatigue mat. Firmness is the ability of the mat to withstand certain pressure. For without increasing resistance to compliance, a mat would simply collapse or bottom-out under the same force that facilitated its compliance. But most of us know "firmness" as resistance against mounting compression, i.e. "support" or not "bottoming-out." The combination of Cushion and Firmness are the two basic responses of an anti-fatigue mat. These two qualities, or factors, are indeed mechanical. Everything mechanical has a cycle. The cycle might be up-and-down, in-and-out, left-and-right or even circular. Every mechanical cycle has two reciprocal ends, e.g. farthest in/furthest out. Cushion (forgiveness) and Firmness (resistance) are mechanically reciprocal, opposite to each in a sense, but necessary to each other within the cycle. Polarity is the length of a cycle, or in other words, the measure between reciprocal factors. Each factor can be measured from the center in opposite directions. 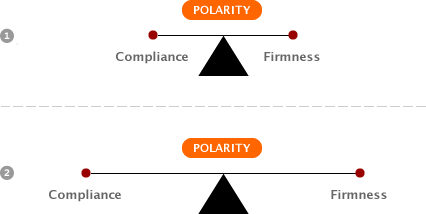 Polarity is important because it represents the high measure of the combined factors. Consider the two drawings below. Each drawing represents a model for a matting product. Each model has different measures of cushion and support; therefore, different degrees of polarity. One of the two models has a greater degree of cushion and firmness than the other model. That same model has the higher degree of polarity. 4. Reciprocity and the Requirement of Symmetry. The definition of "reciprocal" is relevant and important. A reciprocal is the "multiplicative inverse of another number, function or factor." By definition, if one factor goes up by "X" the other reciprocal factor must inversely go up by "X". Well-working mechanical functions have reciprocal actions. Consider that the distance a rod goes up must equal the distance the rod goes does down. The length of an extended arm must equal the distance of its retreat. The point on a wheel must keep its radius. Inherent within the mechanical model is the requirement of symmetry. Any mechanical model without symmetry will fall between being inefficient to failing. Look at the three models below. Which model would work best? It is reasonable to conclude that the first model would work best because there is symmetry between the reciprocal factors. If the measures of cushion and support are major factors in the performance of matting, what happens if the factors are not reciprocal? All mechanical functions depend largely on symmetry between their factors. If a bar extends ten inches, it must retreat ten inches. Consider a pump that can take-in seven gallons of water, but can only release one gallon. The effective use of the pump is one gallon per cycle. 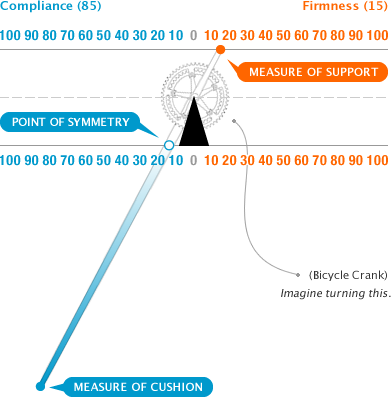 If the requirement of symmetry is adopted, then if the measure of cushion in a mat is 40%, the optimum degree of support will be 40%, even if the actual measure of support is greater. If cushion measures at 73%, then the optimum measure of support is 73%. The point at which both factors are equal is the Point of Symmetry. The Point of Symmetry is the effective cut-off point for the one factor in excess. According to this theory, beyond the point of symmetry, the excess in the second factor is largely ineffective. To make it conceptually easy, consider a children’s see-saw. Second Supposition: Effective ergonomic mechanisms depend largely on the symmetry between their reciprocal factors. Beyond the Point of Symmetry, the factor in excess is largely ineffective. Some ergonomic products work better than others. Consider an extreme example of a waterbed being marketed as an ergonomic mat. Inadequate-to-detrimental performance of an "ergonomic" mat. Third Supposition: Cushion and Firmness are major factors in the performance of certain ergonomic mechanisms that include anti-fatigue matting. The effectiveness of the mechanism is limited by the performance of the lesser factor. Imbalance between the major factors will range from unnoticeable; to ineffective; to being a hinderance; to being detrimental. Part III. The Importance of Timing. Alone, high measures of cushion and firmness in a mat are inadequate if the mechanism itself fails to respond in a timely manner consistent with the mass and movement of the body. In other words, there are big and little people who move at fast and slow speeds. An effective ergonomic mat must complete its cycle return to a neutral/ready state within a necessary time. Mechanical timing in a mat is called resilience. The measure of resilience is especially important when the ergonomic mat contains high degrees of cushion and support. A greater length of its half-cycle (cushion) necessarily reflects a greater length of the other half-cycle (firmness), making important it’s cycle time. Inversely, limited mechanisms will demonstrate a disproportionately high amount of resilience because of their shorter cycles and required time for completion. 1. How Much Cushion and Firmness is Enough? What is optimum compressibility of a mat? 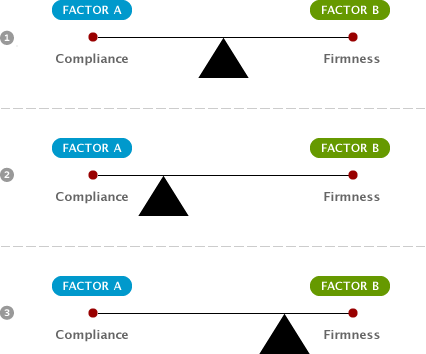 What is optimum firmness? In general, light persons require a lot of cushion in a mat, and heavier people require a lot of support. Because that one mat must work of both groups of people, it is reasonable to conclude that a mat should contain high degrees of both properties. If you’re sitting and making decisions about those who stand, be critical of claims and charts. Ask for the data behind the claims and charts. If you make decisions on the floor, in practice, you can assume that you "got it" when your co-workers, from both sides of the weight spectrum, say it’s works for them, empirically tried and approved. 2. Is it the Material, or is it the Design? The issue of design in anti-fatigue mats is rarely examined. The lack of attention to design seems to be because most anti-fatigue mats are made of solid foam. If a design is incorporated with the material it is because that material can be formed into a design, and the design itself can further the materials’ efficacy beyond their raw form. 3. What Material is best-suited for anti-fatigue matting? The material in an anti-fatigue mat should be alive. The material should be able to stretch, push, bend and twist. Equally important the material must have excellent memory, the ability to return to its original form. Consider the choices of material: wood, rubber, steel, rock, cloth, or plastic. What material can alter form and quickly return to its original form? It may be well to consider the material used in the soles of athletic shoes, since athletic shoes are about as close as it gets to the function of anti-fatigue mats. Ergonomic mats simply augment the function of good soles by way of greater capacity in volume and design. 4. The Quality of Material. A class of material, whether concrete or rubber, is a general classification. The quality of the material within a class may vary substantially. The quality of any material can be inferred by knowing its physical properties. In the case of rubber, for example, the quality can be judged by its Hardness, Specific gravity, Tensile strength, Tear resistance, Elongation at break, Abrasion resistance and Compression set. A clean-room certification is a good indication of the absence of substitutes. Thickness is a static measure. It is not a measure of performance. Resilience is a measure of performance. Tear resistance is a measure of performance. To infer that the thickness of a mat is an indication of a mat’s performance may have, at most, some marginal truth, but generally is erroneous. The more efficient the mechanics within a mat, the lower its profile may be. Mats with higher profiles are generally less efficient. Some thick mats may pose a risk of instability from excessive lateral movement. The subject of slip resistance in matting has been the subject of many articles, and is addressed only briefly here. In excessively wet and oily environments, the major issue is preventing slips. Slip resistance is best achieved by using a firm material that has a high coefficient of friction, such as PVC tiles impregnated with Aluminum Oxide. The issue of impact absorption is important in running shoes. But since workers do not run within the facilities, this issue is nominally mentioned here. In general, anti-fatigue mats should be able to absorb enough of the kinetic energy from a "direct strike" so that the impact of the strike goes unnoticed, or is only mildly felt. Mats of supple material tend to be easy to handle during maintenance. Ease of handling is an ergonomic issue. Moisture underneath the mat will degrade foam backings, diminishing the mat’s performance. Areas with surface moisture would do better with material that is non-porous, preserving the life of the mat and its original performance. This paper was written for several reasons. First I could find very little information on the subject from the universities. Secondly, I found that the certain claims by manufacturers were baseless- simply marketing exploits made without foundation, standards or objectivity. Finally, there can be no grade for quality if there is no standard for grade There are no standards in this industry. There are no guidelines. How can this be possible?